This continuing education course merges research-based, scientific information with practical and adaptable plans that you can use with your clients to enhance exercise programs and guide optimal nutrition decisions. Physical activity and nutrition can have a major impact on an individual’s current and future health. 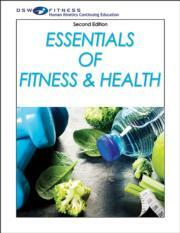 Essentials of Fitness & Health, Second Edition CE Course, merges research-based, scientific information with practical and adaptable plans to help you construct a customized program. This course provides simple ways to assess your client’s current health status and, using the insights gained, enhance an exercise program as well as make optimal nutrition decisions that support personal goals. List the health-related benefits gained through regular participation in physical activity and exercise. Know the importance of following the recommended dietary guidelines for the overall improvement of health. Understand the purpose of evaluating the health status of potential participants in fitness programs. Recommend an appropriate fitness program for a potential participant based on the preparticipation health screening and fitness test results. Develop exercise programs that include activities that promote aerobic fitness, muscular fitness, flexibility, and neuromotor fitness. Calculate and interpret body mass index (BMI) for an individual, and determine the individual’s daily energy requirements. Select an effective exercise program for weight management based on the role that energy balance and exercise plays in weight loss and weight management. Create individual exercise programs and recognize exercise precautions for people in certain age groups, as well as for those with chronic diseases and specific health conditions. A continuing education course for health and fitness professionals looking to refresh or refine their skills in working with individual clients. The American College of Sports Medicine (ACSM), founded in 1954, is the largest sports medicine and exercise science organization in the world. With more than 50,000 members and certified professionals worldwide, ACSM is dedicated to improving health through science, education, and medicine. ACSM members work in a range of medical specialties, allied health professions, and scientific disciplines. Members are committed to the diagnosis, treatment, and prevention of sport-related injuries and the advancement of the science of exercise. ACSM promotes and integrates scientific research, education, and practical applications of sports medicine and exercise science to maintain and enhance physical performance, fitness, health, and quality of life.